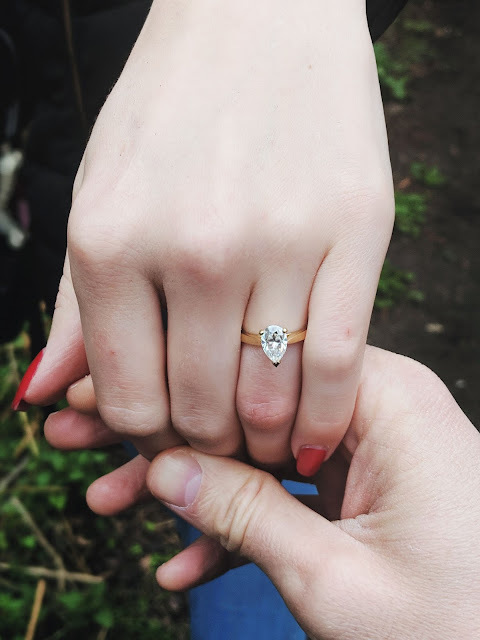 I promised in my last blog post about our engagement, that I'd write a post about the ring I chose and why I chose Moissanite as the stone. As I alluded to before, I did a lot of research for this ring so thought I'd share the shortened version for anyone else thinking of choosing moissanite. Moissanite is a crystal mineral of silicon carbide and was discovered by a chemist called Henri Moissan in 1893. He discovered it in a meteor and incorrectly thought it was diamond! In the late 1990s, Charles and Colvard started using moissanites in the jewellery market. Sparkling my moissanite (below) with my Mum's 1.25 carat diamond (above) in direct sunlight. You might notice the sparkles in a diamond are white, but the ones from a moissanite can be rainbow colours and white. My interest in moissanite started about a year ago - I love Reddit and frequently stalk the JustEngaged subreddit. I noticed a lot of chat about a new-ish stone called moissanite, however at the time, most moissanites were quite "warm" (apparently a nice term for yellow) and the whiter ones didn't come in many interesting cuts. However more recently the Redditors seemed to agree things were improving. When Sam and I discussed rings, I started looking into moissanites and through this googling, I discovered that the best ones on the market were Charles and Colvard Forever One moissanites which were nearly colourless, didn't have the "warm" hues anymore and had started being produced in fancy cuts like pears and ovals. Plus you also get a lifetime guarantee on their moissanites, just in case I chipped it or something, although this shouldn't be possible. The next challenge was finding a Charles and Colvard Forever One moissanite in the UK. They are an American brand and it was actually really hard to find a legitimate looking seller in the UK. The places listed as stockists on the C&C website either didn't have pear shapes, or they only sold wholesale, or just looked dodgy! I finally found Lily Arkwright who stocked pear shapes and could make bespoke rings and got in contact with them. They talked me through the creation process, asking me to choose a stone size and metal. They have this stone size comparison chart which I printed and cut out to try on different stone sizes. 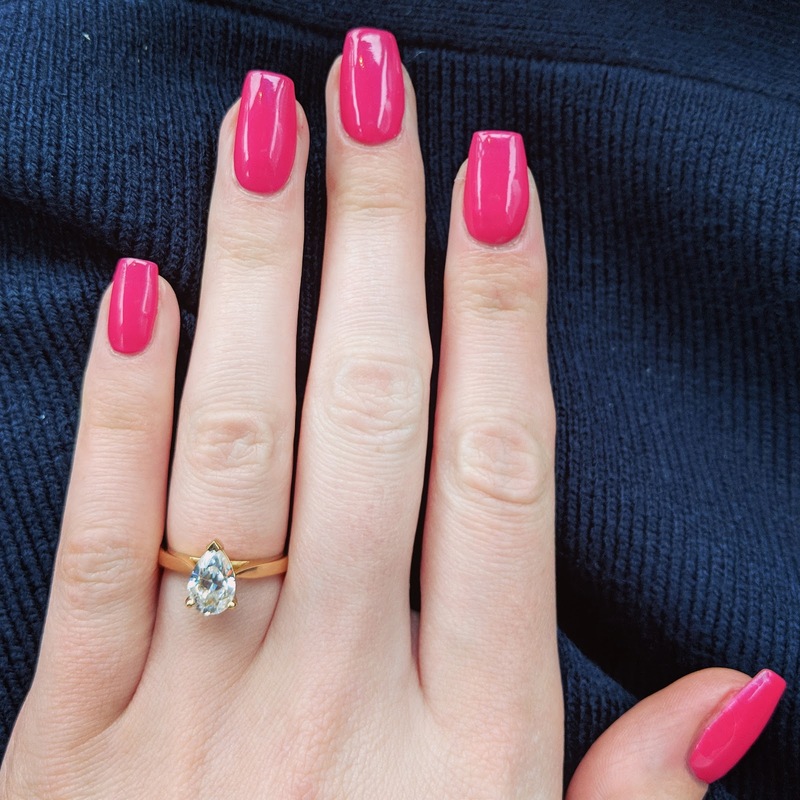 I sent photos to my family and best friends and settled on a 9x6mm stone for my size K1/2 finger (the equivalent to a 1.5 carat diamond - diamonds are measured by their weight but moissanites are measured by their size). I also really enjoyed chatting through the process at each stage with Sam - he's full of good advice and helpful opinions and he said he was surprised he had more of an opinion than he thought he would! I told them I wanted the Isabella ring in 18k gold but with a pear-shaped stone. They really quickly sent me some mocked up drawings and created me a custom listing which I could send to Sam for him to buy. The Celine ring is very similar, but I wanted one that got thinner on the band as it went into the stone, which I think is called knife edge. The normal Oval Isabella with a 1.5 carat equivalent stone was £1,155.00 which is much cheaper than £9,409.00 on Samantha James for the diamond version. Overall, I absolutely love my ring! I love the sparkles, shape, size, the meaning behind it, everything! I would really recommend moissanite to anyone looking for an alternative to diamonds but who likes a clear stone. I'd also really recommend Lily Arkwright for their fantastic communication and customer services. I know of a few people who own moissanites who like to pass them off as diamonds, and I'm sure that's completely possible. However I'm really proud it's not a diamond and am open to talking about what my extra-sparkly stone is. Sam and I had a few conversations about how it felt to not be buying a diamond, and we noticed there was almost an unspoken pressure to get a diamond because it's "the best", and it took us a while to challenge that and feel comfortable choosing a diamond alternative. However I'm really pleased with our choice. Finally, some thoughts around the difficulties with fancy cuts - I always knew I wanted a pear shape, but on lots of forums, people were complaining of "bow-ties". This is essentially where the light going into the stone is blocked by our head when we look at the stone. In badly cut pear and oval shaped diamonds, this can cause the appearance of a black bow-tie shape in the middle of the diamond. 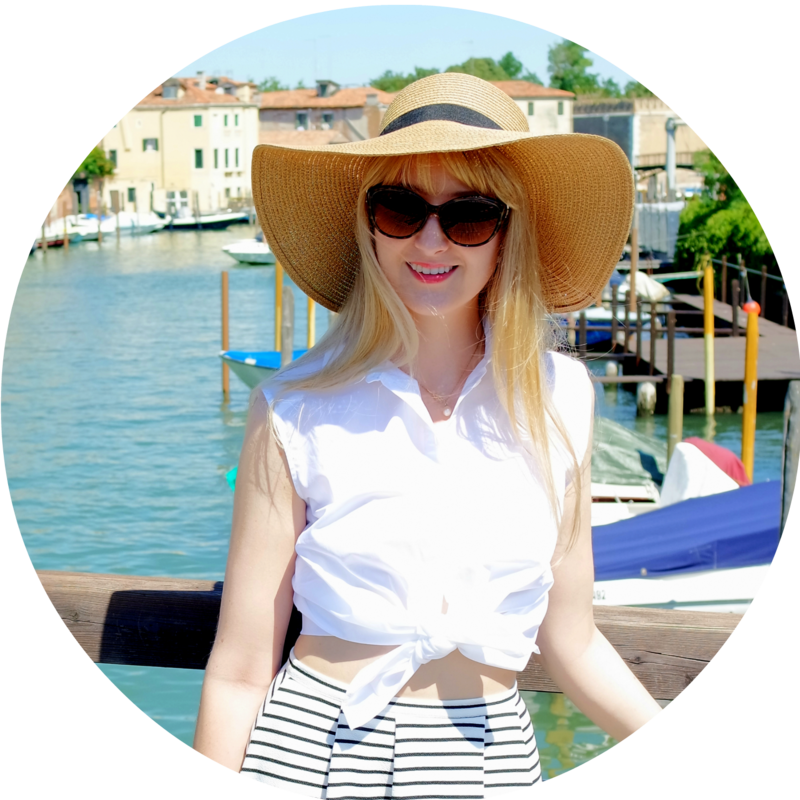 It was really hard for me to look at moissanites and see how they do for bow-ties so I had to take a chance, but was reassured that Lily Arkwright do free returns. I'm pleased to show you that they are very well cut and I haven't noticed any bow-tie in mine, just a tiny circle that you'd see in any round diamond/moissanite.